This year, for the first time, the virtual world of InWorldz will have its own Relay For Life season. After more and more residents started to volunteer to raise funds in InWorldz, the American Cancer Society has stepped to give its official blessing to the initiative and to make official the very first Relay For Life of InWorldz. Relay for Life in Inworldz will take place after Relay for Life in Second Life has concluded, so there will be no over-lap. The Season in Inworldz will last from the 18th of August to the 3rd-4th of November (Relay Weekend) with a half-way event scheduled for the 22-23 September. A wrap up and closing party will take place on the 17th of November. 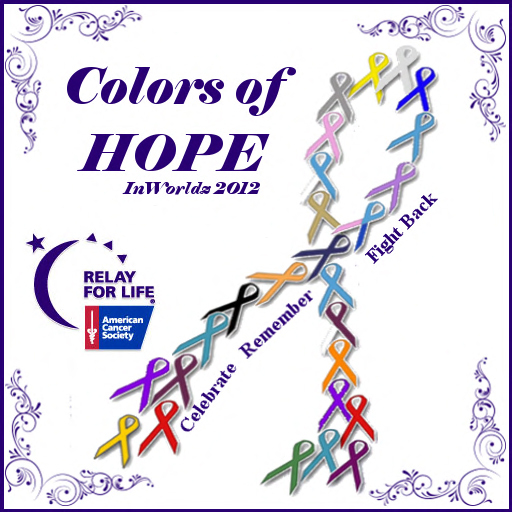 The theme for this year’s event – as you can see from the logo – is “Colors of Hope”. The organizing committee is chaired by Fayandra Foley, a veteran of many Relay For Life Campaigns (twice event chair of RFL of SL), assisted by Eilidh McCullough – another popular figure of many RFL of SL seasons – as co-chair. Many volunteers, both Inworldz natives and veterans with experience in RFL of SL, are contributing to the effort to make this first season a success. A blog is under contruction at the address: http://inworldz-relayforlife.blogspot.com , and will be soon be operative with all the most relevant information and the latest news, including the list of events that are starting to be organized. Relay For Life is the main volunteer-driven cancer fundraising event of the American Cancer Society. Originating in the United States, the Relay For Life event has spread to many countries and virtual worlds. See more here. InWorldz is a Virtual World initially based off the OpenSim software. Created by InWorldz LLC, it is intended to give freedom to creativity, socialization and exploration of imagination. See more here.